Researchers from North Carolina State University have discovered a new phase of solid carbon, called Q-carbon, which is distinct from the known phases of graphite and diamond. They have also developed a technique for using Q-carbon to make diamond-related structures at room temperature and at ambient atmospheric pressure in air. Phases are distinct forms of the same material. Graphite is one of the solid phases of carbon; diamond is another. "We've now created a third solid phase of carbon," says Jay Narayan, the John C. Fan Distinguished Chair Professor of Materials Science and Engineering at NC State and lead author of three papers describing the work. "The only place it may be found in the natural world would be possibly in the core of some planets." Q-carbon has some unusual characteristics. For one thing, it is ferromagnetic – which other solid forms of carbon are not. "We didn't even think that was possible," Narayan says. In addition, Q-carbon is harder than diamond, and glows when exposed to even low levels of energy. "Q-carbon's strength and low work-function – its willingness to release electrons – make it very promising for developing new electronic display technologies," Narayan says. 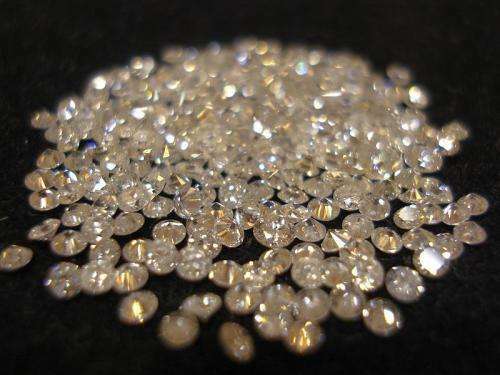 But Q-carbon can also be used to create a variety of single-crystal diamond objects. To understand that, you have to understand the process for creating Q-carbon. Researchers start with a substrate, such as sapphire, glass or a plastic polymer. The substrate is then coated with amorphous carbon – elemental carbon that, unlike graphite or diamond, does not have a regular, well-defined crystalline structure. The carbon is then hit with a single laser pulse lasting approximately 200 nanoseconds. During this pulse, the temperature of the carbon is raised to 4,000 Kelvin (or around 3,727 degrees Celsius) and then rapidly cooled. This operation takes place at one atmosphere – the same pressure as the surrounding air. The end result is a film of Q-carbon, and researchers can control the process to make films between 20 nanometers and 500 nanometers thick. By using different substrates and changing the duration of the laser pulse, the researchers can also control how quickly the carbon cools. By changing the rate of cooling, they are able to create diamond structures within the Q-carbon. "We can create diamond nanoneedles or microneedles, nanodots, or large-area diamond films, with applications for drug delivery, industrial processes and for creating high-temperature switches and power electronics," Narayan says. "These diamond objects have a single-crystalline structure, making them stronger than polycrystalline materials. And it is all done at room temperature and at ambient atmosphere – we're basically using a laser like the ones used for laser eye surgery. So, not only does this allow us to develop new applications, but the process itself is relatively inexpensive." And, if researchers want to convert more of the Q-carbon to diamond, they can simply repeat the laser-pulse/cooling process. If Q-carbon is harder than diamond, why would someone want to make diamond nanodots instead of Q-carbon ones? Because we still have a lot to learn about this new material. "We can make Q-carbon films, and we're learning its properties, but we are still in the early stages of understanding how to manipulate it," Narayan says. "We know a lot about diamond, so we can make diamond nanodots. We don't yet know how to make Q-carbon nanodots or microneedles. That's something we're working on." NC State has filed two provisional patents on the Q-carbon and diamond creation techniques. The work is described in two papers, both of which were co-authored by NC State Ph.D. student Anagh Bhaumik. "Novel Phase of Carbon, Ferromagnetism and Conversion into Diamond" will be published online Nov. 30 in the Journal of Applied Physics. "Direct conversion of amorphous carbon into diamond at ambient pressures and temperatures in air" was published Oct. 7 in the journal APL Materials. Well that is just awesome! Sounds like a promising material that is relatively easy to create. Can this lead to large transparent windows on space craft , domes for space and deep sea. Very exciting. And we are still worried about our future carbon emissions. Atmospheric carbon is going to be something people are screaming to stop stealing in another few decades. Countries will be suing each other for taking out more than their fair share of Carbon Dioxide. Venus will see its population skyrocket if only to feed the ever growing demand for Carbon here on Earth. Hard to believe that this is the first occurrence of carbon glass. They've been lasering carbon for decades now. But as usual, elemental glasses almost always have interesting properties. Unfortunately lack of any kind of volume production may be the downfall for their usage. Metallic glasses have been studied since the 70's and I haven't seen much of their special properties being used yet either. ONE.. of it's major claims, for this food of the gods, the white powder of gold, is that it is MAGNETIC. Now, this no longer seems so damned strange, does it??? hmm? Room temperature technique for turning carbon into diamond, and it's magnetic. So, room temperature nanogold handled in a PH shifting mix, in a sealed vessel..... and it comes out magnetic, and it is also superconducting. The white powder of gold story is over 12,000 years old. Solomon's temple was all about manufacturing it. TWO of it's strange claims turns out to be possible, incredibly probable, and proven in multiple ways! What else about it is true? "a technique for using Q-carbon to make diamond-related structures at room temperature" - "During this pulse, the temperature of the carbon is raised to 4,000 Kelvin (or around 3,727 degrees Celsius) and then rapidly cooled." Obviously it isn't "made" at room temperature." Don't you love pop science journalism's inability to communicate even the most basic facts accurately and without exaggerating or sensationalizing them? KBK's confusion may come from the widespread journalistic practice of conflating "carbon," the dirty black sooty stuff, with CO2. The idea apparently is to tag the colorless, odorless, live-sustaining gas with the nasty image of a noxious pollutant. The misleading use of "carbon" in headlines and of clip art smokestacks belching black smoke is part of the "Mighty Wurlitzer" --- the disinfo machine --- used by the climate science industry and its elite backers to terrorize the public into accepting "sustainability" as defined by the UN's Agenda 21. Obviously it isn't "made" at room temperature." @Dug, I think this is still a room-temperature process. The laser beam heats a small part of the material to 3727 C, which is drastically different than heating a furnace to that temperature and making the q-carbon that way. A short distance away from where the laser is hitting the sample, there probably isn't much of a change in temperature at all. So, while the material might not be experiencing room temperature, the only energy that needs to be put in is the laser light, and all of the surrounding apparatus are at room temp. I don't think anything has been sensationalized or exaggerated by journalists here. This would make a good project for space manufacturing research, maybe to find ways to make this in large volume with a more crystalline form. Harder than diamonds and ferromagnetic too. The possibilities for making some cool technology with this stuffs is endless. Good for you NCSU-Skippys, I hope you can make some money from it. If this means there will be glasses and displays I can afford yet cannot scratch, then, for me, this is very exiting news indeed. My response was directly related to the subject at hand, as a previously abstract parallel in the subject of atomic translation and transmutation. This particular change in carbon shows the fundamentals in this other area of fringe and cutting edge science as being not fantasy, but a simple scientific reality. Honestly I'm considering 3D printing applications and large scale applications such as building supplies. The creation of larger buildings and more efficient space craft and electronics is only a glimpse at the possibilities that are available with such technology. Regarding room temperature: While the Q-carbon itself is formed at a high temperature, the equipment is all at room temperature and pressure. The carbon transformation is also so fast that the substrate it is formed on can remain at room temperature - for example, they formed q-carbon on polyethylene film (a plastic that melts at roughly around 100 Celsius). If they can put the stuff on bits for lathes, etc... it will be very useful to that industry. They are always looking for longer lasting cutting materials.